UCSF Chancellor Sam Hawgood, MBBS, will deliver his fifth State of the University address on Tuesday, Oct. 30, from noon to 1 p.m. in Cole Hall on the Parnassus campus. The Chancellor will share highlights over the past year, including major milestones in research, education and patient care, as well as acknowledge the great work of members of the UCSF community. 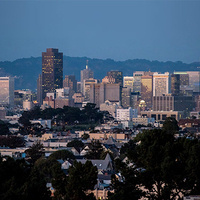 He will also provide updates on UCSF’s current initiatives and plans, including the revitalization of the Parnassus Heights campus and the campaign to raise $5 billion to sustain UCSF’s robust enterprise and to recruit and retain top talent. The Chancellor will focus his remarks on UCSF’s extensive work in the community to address health inequities and some of the most challenging societal issues, such as homelessness, mental health and poverty. The address will be presented live in Cole Hall on the Parnassus campus and from UCSF Benioff Children’s Hospital Oakland. It will be live streamed on YouTube and simulcast at Byers Hall in Genentech Hall at Mission Bay, Herbst Hall at Mount Zion as well as in Fresno. Joining the Chancellor for his presentation will be Margot Kushel, MD, professor of medicine and director of the Center for Vulnerable Populations at Zuckerberg San Francisco General Hospital and Trauma Center, and Dayna Long, MD, medical director for the Department of Community Health and Engagement at UCSF Benioff Children’s Hospital Oakland. Kushel’s research focuses on the causes and consequences of homelessness and housing instability, with the goal of preventing and ending homelessness and ameliorating the effects of homelessness on health. Her research seeks to inform clinical practice, programs, and policies. Long is finding ways to use health care settings as a buffer against toxic stress in order to help kids achieve better outcomes. She is working in Oakland and collaborating with other UCSF researchers on multidisciplinary clinical programs, trials and partnerships to address disparities that will help improve the health of all children.